Intelligent Electronics’ Raleigh Showroom has many types of speakers to audition. See and hear the differences between speaker designs. Speakers are by far the most diverse product in an audio or home theater system. They come in subwoofer and satellite combinations, tower type full range variety, bipole, dipole, bookshelf, outdoor speakers and all weather speakers. Speakers also come in many finishes. Some are glossy, extruded aluminum, or furniture quality in real wood finishes. Others are tall and narrow or flat to look in place on the wall next to a flat screen TV. To add to the confusion, the technical designs of speakers make them suited for specific rooms and musical tastes. Speakers must also be matched to the equipment and the other speakers in the system. Speakers are very personal, like buying a new car. What one person likes, another may find unappealing. Without proper training, it is difficult to set up the speaker to mesh with the tastes of the owner. We regularly have clients come in to see a particular projector only to realize the speakers we are using sound better than the ones they just bought — and often cost less. They may have purchased them based on reviews or the recommendation of a friend. Don’t make this mistake. Hearing is believing! Visit our showroom for an A-B comparison of several different, professionally calibrated speakers. We can show you your options in 5.1 surround sound speakers and 7.1 surround sound speakers, we also have new Dolby Atmos setups to show you along with bookshelf speakers, home theater speakers, THX certified speakers, floor standing speakers, in and on wall speakers, tower speakers, mini-surrounds and full speaker packages. Subwoofers come in many sizes, shapes and finishes. There are small, high powered ones; large, sealed ones; some with room correction equalizers; others that are made to hide away. The rule of thumb says that you can’t have a big enough sub, but you can have the wrong type, or put it in the wrong place. Subs need to match the other speakers in the system, but they must be scaled to the size of the room. A subwoofer’s placement and calibration are critical to it’s performance and the difference is incredible. Speakers are very personal, like buying a new car. What one person likes, others may find unappealing. We regularly have clients come in to see a particular projector only to realize the speakers we are using sound better than the ones they just bought — and often cost less. They may have purchased them based on reviews or the recommendation of a friend. Don’t make this mistake. Hearing is believing! Visit our showroom for an A-B comparison of several different, professionally calibrated speaker systems including subwoofers. Compare multiple subwoofers designs in our showroom. 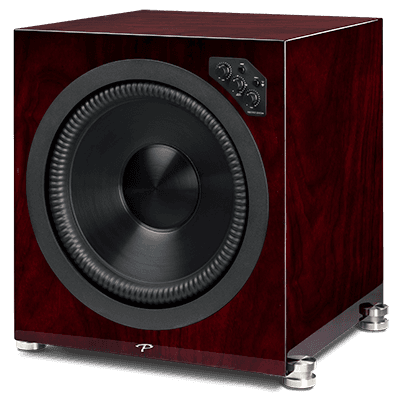 We can show you your options in subs including powered subwoofers, home theater subwoofers, compact subwoofers, in wall subwoofers, THX Certified Subwoofer and find which one best integrates into your system and room. There are several good reasons in wall speakers can be a great solution. In wall speakers, sometimes called disappearing speakers or built in speakers, get the speakers out of the room for a clean look and create a child or pet friendly space. 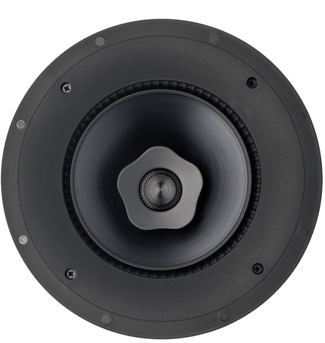 Recessed Speakers can be less expensive than a similar box speaker because there is usually no enclosure to add to manufacturing and shipping costs. In ceiling speakers are great for background music. If positioned correctly, in ceiling speakers make great effect speakers for a surround sound system in a media room or family room application. Speaker selections, in general, are very personal. Matching the right speakers to the room, the other equipment and your ears can only happen when you audition several types of speakers side by side. Hearing is believing! Visit our showroom for an A-B comparison of several different, professionally calibrated speaker systems. Intelligent Electronics’ Raleigh Showroom has many types of speakers to audition. See and hear the difference between in wall, in ceiling, on wall and traditional box speaker designs. is the right choice for you and your application.